It's absolutely amazing how many people travel with the President. I was wondering if my home in Carlsbad would still be standing by the end of this week. Two wildfires came within a few miles of my house. 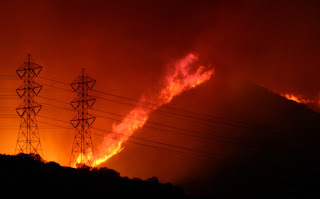 That may not sound very close until you consider just how fast these fires moved. The previous day they easily covered 20 miles. The reverse 9-1-1 system worked very well and I received an automated call about the voluntary evacuation south of Palomar Airport Road. 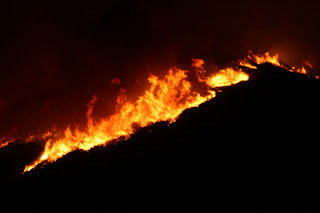 I took these photos from the I-5 at Camp Pendleton as I drove home last night - about 25 minutes from my house. 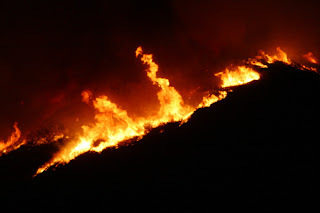 This fire was intentionally set as a backfire in response to a fire that originated at Horno, on Camp Pendleton, which is home to the First Marine Division. 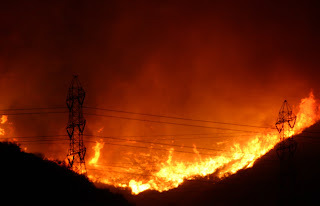 The backfire "backfired" as it got out of control and traveled west, over the mountains, to the Pacific Ocean about four miles away where it jumped the freeway. When it hit the ocean it turned north towards the San Onofre nuclear power plant and San Clemente a few miles away. Shortly after I took these photos the I-5 was closed in both directions. 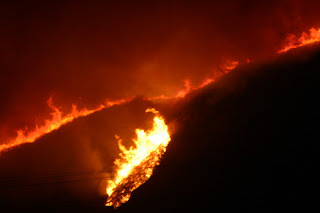 Luckily, no homes have been damaged by this fire but one section of military housing, near San Clemente, was evacuated. However, inland areas around Escondido and Rancho Santa Fe have been devastated. Total area consumed by these wildfires: Google Maps. - Leave outside lights on so FD can see your home through smoke. When a photographer snaps a photo, he or she owns the copyright to that photo. The copyright is secured upon creation of the work by the artist. So, if I'm traveling with my family on vacation and I have a stranger take our family photo, should I get the stranger to sign a release? Of course, this is a non-issue, but I could easily see a rare case that would capture the media's attention. OpenID is a decentralized single sign-on system. Using OpenID-enabled sites, web users do not need to remember traditional authentication tokens such as username and password. Instead, they only need to be previously registered on a website with an OpenID "identity provider..."
Here's how it's suppose to work... you create a profile at one OpenID server and then all other Web sites that use OpenID can refer back to the original OpenID server where you created your ID. So, after a week of trying it out I've discovered that, generally speaking, each site that hosts an OpenID server will want you to use their own OpenID server. I reached this conclusion when I created an OpenID profile at myopenid.com and then, several days later, I need to go through the whole process again at myvidoop.com. Sure, I'm probably misunderstanding how OpenID is suppose to work - so don't hesitate to correct my misperceptions. 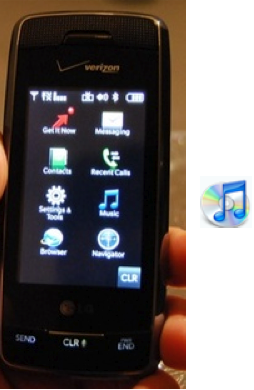 Is that iTunes on Verizon's New Phone? Nope, that's not iTunes. The similarity is just an amazing coincidence. 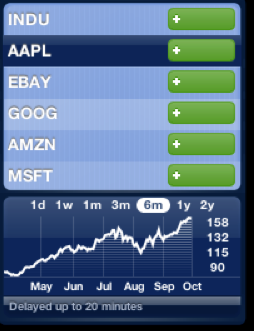 What happened to Apple's Stock Quote Dashboard Widget? It stopped working yesterday - obviously a server issue. 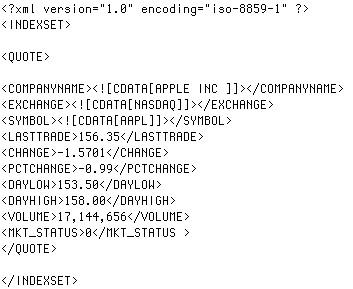 I'm wondering if this is related to Leopard's forthcoming release or, perhaps Quote.com is no longer providing Apple with their quote data. First, NBC now Quote.com - when will it end! If your widget looks fine, try restarting it by clicking on it and pressing cmd-R.
Update 2: After 36 hours it's working again.